I work at a small consultancy and we often make web apps for our clients. One part of the web app that is often repetitive to write is the authentication system. In a lot of our web apps we would like to support OAuth login from the various providers as well as email-based registration. However, programming this in every web application is time-consuming. Ideally what we'd like is a generic, authentication proxy server that sits in front of the application server and handles everything related to authentication (including login, registration, and logout). I'm wondering if something like this would be secure? Or if there is any security-related reason why it should not be done like this? This is basically a reverse proxy server. It has its own database with information related to authentication (for example, email address, password, etc). It checks each request for a specific cookie with session information (for example, a JWT in a cookie called SESSION). This session information would be proof that the user has logged in correctly at some point in the past. If the session information is correct, it adds an X-UserId header to the request and forwards it to the Application Server. If there is no cookie with authentication information, or if the session information is incorrect, then it forwards the request to the application server without the X-UserId header. It will have specific routes for logging-in, logging-out, and registration (for example, /login, /logout, and /register). It will handle these requests completely on it's own. The Application Server will not even be aware of these requests. This is a normal web application server. It performs no authentication, relying entirely on the X-UserId header from the Auth Server. It is not accessible from the outside world. The only way to access it is by going through the Auth Server. It also has its own database. It is filled with all the information related to the application (except for authentication information). Here are the steps for getting the login.html page. The client sends a request for /login.html. The Auth Server receives the request. The Auth Server tries to look for a cookie called SESSION. It doesn't exist, so it forwards the request to the Application Server without adding a X-UserId header. The Application Server receives the request. There is a route defined for /login.html and it doesn't require the X-UserId header to exist, so it returns the HTML for login.html. The Authentication Sever receives the response, and forwards it back to the user. The login.html page could contain the JS code for actually logging in. Here is one possible way to do it. The client sends an AJAX request to /login/email to login using an email address and password. The Auth Server receives the request. Since this is a request for the Auth Server, it does not forward the request to the Application Server. The Auth Server looks at the request body for an email address and password. It checks the email address and password in its Auth DB. If the email address and password are correct, it returns an HttpOnly cookie called SESSION that contains a JWT. The user sends a request to /home.html. The Auth Server receives the request. The Auth Server checks the SESSION cookie and decodes the JWT. 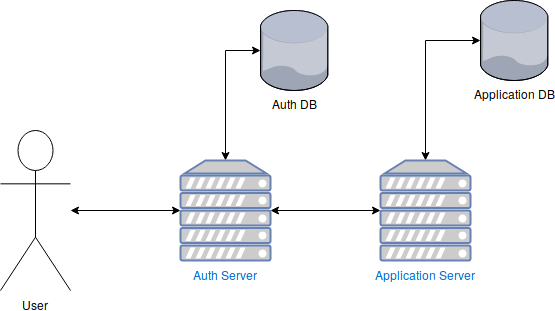 The Auth Server gets the User Id from the database based on the information in the JWT. Let's say that the User Id is 5. The Application Server receives the request. Since the request is for /home.html, the Application Server knows that a valid User Id is required, so it checks the X-UserId header. The Application Server successfully gets the User Id from the X-UserId header and uses it to pull data out of the Application DB and build the home.html page. The Application Server sends the response with the home.html page to the Auth Server. The Auth Server receives the response, and forwards it back to the User. The Auth Server would remove the X-UserId header if sent by a user before forwarding the request to the Application Server. The Auth Server could be relatively general, and used on multiple different projects. The Application Server wouldn't have to worry at all about authentication. The Application Server would need to be in charge of authorization (for example, making sure that each user could only edit their own information). The Auth Server would completely handle new user registration. This could include an OAuth flow (for using OAuth as provided by Google, Twitter, Facebook, etc), as well as simple email-based registration. When a new user registers, the Auth Server would create a User Id and link it to the user's email address, Google username, Twitter username, etc. The Application Server would only ever see this User Id (never the user's email address, Google username, Twitter username, etc). Is a setup like this secure? Reverse Proxies are pretty common for what you are asking. Quite a few companies make servers designed for what your asking so you could use that as a reference. For instance, I've used WebSeal (IBM ISAM) quite a bit at company's (seems popular for some reason around me). They have modules already build for OAuth, and most other type of authentication. provide a single "Identity" across multiple systems with difference User stores. Combinations for all of these. OAuth is an AUTHORIZATION protocol NOT an AUTHENTICATION protocol. When you are trying to establish identity, look to OpenID or JWT or SAML or run as your owned Identity Provider. When you are trying to authorize a request look at OAuth 2.0 or JWT. Have Web Applications use an authorization token to get a access token. Use access tokens to provide protected resources. This is a great setup. Look into google's beyond corp documentation to learn more about how they think about networks and this type of access. If you do want to roll your own, you can use something like duo network gateway. But the problem with reverse proxies is you have to point all the DNS to the same IP of the reverse proxy and manually configure each resource. Another approach is a combination of PAC files and a forward proxy that requires authentication. Then you can specify that ANY URL be sent through the forward proxy, the forward proxy performs authentication, and passes the traffic to the resource wherever it is. The resource can be configured to only allow source IP address. Not the answer you're looking for? Browse other questions tagged authentication web-application proxy http-proxy api-gateway or ask your own question.